FLASH: YOU WAITED TOO LONG!!! Animals for the 2017 HARVEST are SOLD OUT. GOOD NEWS! You can reserve your beef package for the coming harvest year. Don't be dismayed Beef Lovers. Our next harvest starts in March-Apr 2018 and a deposit of $100 will reserve your Premium HFW-BEEF™© package. FLASH: We only harvest animals once per year and we are NOW taking deposits for the 2017 harvest. Get your contact information to me for notification of the 2018 harvest availability. We had 21 available beef animals for the 2014 harvest. However, they went extremely fast. A majority of them were spoken for with deposits in about 3-4 days and all were gone in about 2 weeks. The 2015 animals went just as fast and the 2016 animals were gone in less that 12 hours after notification emails were sent. If you are interested in the 2018 harvest, or getting on the list if some one falls out on the current or next harvest, I suggest you getting your contact information to me. And do not hesitate reserving your package when notified of availability of animals. Send in your information on the contact page to be notified of animals I still have available for this harvest. I currently harvest in the Mar.-Apr. time frame of each year. If you are interested in reserving a beef package for next year's harvest, you may do so with a $100 deposit. Your deposit will reserve a 1/4 or 1/2 beef package until shortly before the animals are gathered to take to the processor. If you wish to reserve more than a 1/2, a $200 deposit will do the trick up to a whole animal. I DNA tested my breeding stock when I started and the DNA scores of the parents of the available animals were either 5 or 6 stars of the Tenderness Gene with most of them being all 6 stars and 1 or 2 stars of the Marbling gene. I endeavor to use the animals with the highest DNA scores for the Tenderness and Marbling genes for breeding in my beef program. However, the animals that are for meat sales have not been DNA tested as this only adds expense to the meat prices. Even though the DNA of the parents does not guarantee the same DNA of the off spring, these traits should be passed on to their offspring and thus give a good indication of the DNA of the animal that you are purchasing. 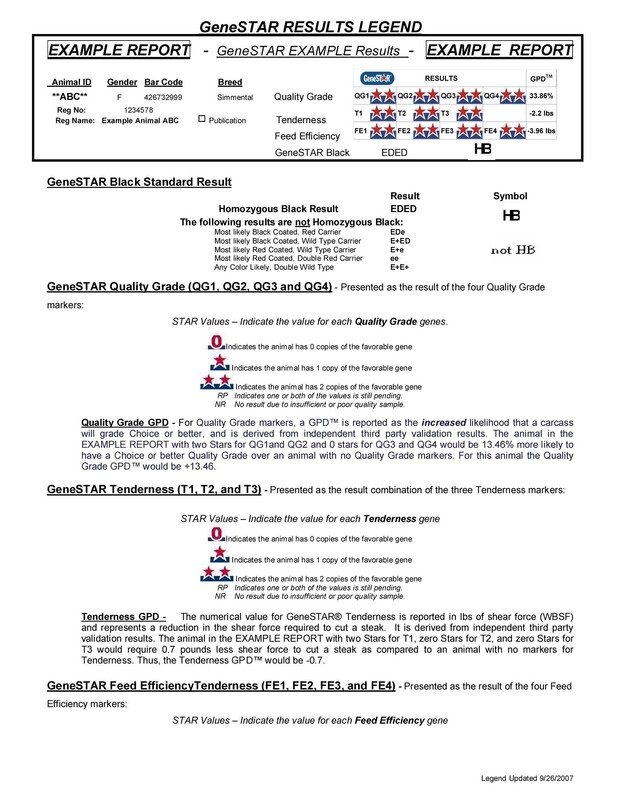 The bull I am currently using in our beef program has all 6 stars of the tenderness genes and 4 stars of the marbling genes. Those animals are now being harvested in our beef program. You may reserve a 1/4, 1/2, ($100.00) a 3/4, or whole steer package with a ($200) deposit. This will hold your package until harvest time. If any thing happens to the animal between the time you place your deposit and any monies paid and the harvest of the animal, all monies will be put on another available animal if available. If none are available, all of your money will be refunded. All money paid applies toward the total price of your beef package. If, however, you decide to back out of your commitment prior to consummating the purchase of your package, you forfeit all monies paid in. The reason for this is, it's not right to tie up an animal for an extended period of time keeping others from reserving it and then have a change of heart. So make sure you want to purchase your package before you commit to it because I am taking that animal off the market and saving it for you and turning away other people who want to purchase a package. I will, however do my best to work with you, if possible, but that in no way guarantees you any refund. ANIMALS ARE ON A FIRST COME FIRST SERVE BASIS. The animals are put on winter grass fields to fatten them up, (called finishing), starting in November or December. They remain there until March-April depending on their size. After that, they are taken to the processor and harvested and the carcasses are weighed; (hot hanging weight). This is the weight on which your total price is figured. The finished weight is less than the hanging weight because of water evaporation during dry aging, trimming, and bone loss during butchering. I.e. : Instead of a T-Bone or porterhouse Steak you have the New York Strip & Fillet cut out. I suggest leaving the bone in. 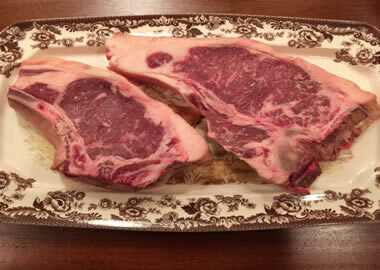 Steaks seem to taste better to me when cooked with the bone in. If you don't like bone in, you can cut it out before you cook your steaks and boil the bone down for beef stock for soup or give it to the dog. He will be in dogie heaven and love you for it. The longer the animal hangs during the dry aging process the beefier the flavor and more tender it becomes. Also the finished weight will be less than the hanging weight because of more water loss. After harvesting, the carcass will be hung in the cold storage unit and dry aged 10 -21 days. This is where the meat undergoes the tenderizing process by the natural enzymes of the Tenderness genes. This is also when the water evaporates from the meat concentrating the beefy flavor. Your meat is then butchered to your specifications, shrink wrapped, boxed, hard frozen, and ready for your pick up at the processor. I use a processor with a Texas State Inspector in house during the harvest process your meat. Your beef will be ready approximately 10-21 days after the animal is taken to the processor. Organ meats, tongue, etc. are not part of the hanging weight. If you would like any of it or ox tail, extra bones for stock or the dog, etc., you can request it on your cutting order and it is divided between those that want them at NO charge; if I'm able to get the processor save them at time of harvest. The Texas State processor I use is in Muenster, TX which is more centrally located to the Dallas/FW area and the Wichita Falls/Vernon area. This makes for a convenient drive for all my customers to pick up their beef packages with just minimal driving. You can use a different processor if you like if you have a whole animal or a buddy that is taking the other 1/2. I will carry you animal to the processor at no additional charge if he is in the same town as the processor I use. I CANNOT be held responsible for any mix-ups or mess ups by the processor. I am guaranteeing you delivery of a live animal to the processor ONLY. We ONLY sell an interest in live animals; not packaged beef. We sell interest in as little as 1/4 animal packages and I guarantee your animal going to the processor. This gives everyone an opportunity to enjoy Premium Gourmet Grass-Fed HFW-Beef™©. A quarter interest of the animal consist of a half split into two equal portions of cuts. IE: Each 1/4 interest gets equal amounts of rib eyes, T-bones, roast, stew meat, hamburger, and so on. It is NOT the front or hind quarter sales. If I can coordinate it in matching cutting orders, quarter packages will be able to order specific cuts. IE: thickness of steaks, etc. However, it would be best if you split a 1/2 with a friend instead of booking a 1/4 yourself. That way you and your friend can agree on the cuts you both want. Otherwise, only 1/2 animal purchases can specify cuts of their package. This is only due to the butcher's set up requirements. They won't change cuts in the middle of a side or 1/2 of beef. Example: 1000 pound live steer will yield an estimated 500 pounds hot hanging weight. 500 pounds X (price/pound) = price you pay for a whole steer. A quarter interest of an animal would be 125 pounds X ($6.00) price/pound or approximately $750.00. If the carcass weighs less, then all amounts would be less, both pounds of meat and dollars. If the carcass weighs more, then all amounts would be more. The 2018 harvest price is $6.00 per pound on the hot hanging weight. You are locking in this price now for the harvest then. This is the total price you pay for your interest in the animal. For this price you get the animal taken to the processor, harvested, dry aged, butchered, and hard frozen waiting for you to pick up your meat. You get all these cuts of meat; hamburger, T-Bone & Porterhouse, Rib-eye, Sirloin, & Flank & Skirt Steaks, Roast, Brisket, stew meat, soup bone, & short ribs. You will get a cutting order to fill out prior to taking the animals to the processor which you can fill out how you want your meat cut. For those of you who are new to this, I will give you some help and advice so don't get worried. All the cuts are the same low price. Lock in your price NOW!!! You can elect this option for just $2.00 per pound over the base grass fed/finished price. If you have an interest in obtaining any of this beef, contact me to see if I can get you paired with another person for the other half of the animal for a hand finished beef. DON'T MISS OUT ON THIS OPTION !!! THIS OPTION IS ONLY AVAILABLE FOR WHOLE ANIMALS. IE: You and your buddy each take 1/2 or I find someone for 1/2. The following are actual hanging weights on some prior animal harvest to help give you an idea of what a particular beef package would be. Each number is the hanging weight of a whole animal. To figure a 1/4 package divide these figures by 4. That will give you the hanging weight of a 1/4. Multiply it times $6.00 gives you the total amount you would pay for the 1/4 package. Use similar steps for 1/2 packages. If a 1/4 beef package is too much for you, "TRY COW POOLING". Spread a little love around and split a 1/4 with a friend. It will be listed in just one person's name and you can split your money and meat with the other person. However, I will be dealing with just one person. This is also what I suggest two 1/4's do so you can get the cuts you want; split a 1/2. Enjoy some tender, juicy Premium Gourmet Dry-Aged HFW-BEEF™© today. Beef with that good beefy flavor. The way a steak is supposed to taste. Remember, our beef cattle are NOT raised with antibiotics, added hormones, or grains; unless you want grain finished. For those of you that ask "how much freezer space do I need for a beef package", here is a rule of thumb. It will take approximately a 10 cubic foot freezer for about 200-250 pounds of meat (about 35 pounds of meat per cubic foot of freezer space). The chest type freezers keep meat longer but hard to organize and find things in. The next best is upright with cooling coils on each shelf, easy to organize and keeps meat longer than the circulating air freezers. And bringing up the rear is the circulating air type which is usually less expensive than the upright with cooling coils on each shelf. I suggest the upright with cooling coils on each shelf since it is easier to find stuff as opposed to the chest type however it is also probably the priciest of the bunch but you can find your stuff and it will get eaten instead of ruining in the freezer. But hey, this is just my opinion and it's worth what you paid for it. Not a testimonial: Just an observation: One customer bought a 1/4 on the first harvest in 2009 and came back and bought a 1/2 steer on the last harvest for the 2009 harvest. Reserve your beef package now. Before they are gone. Click the Cow Horn button below to go to submit an order ! SEE WHAT YOU ARE MISSING!!! -- THIS COULD HAVE BEEN SUPPER. This will give you an idea as to the amount of hanging weight. Rule of thumb is hanging weight is 50%-60% of live weight. Click on it to enlarge. 2017 animals will be Murray Grey's and this is representative of them. These steers are a pure bred Murray Grey cattle. This is just an example of the animals that I will have for the next harvest in Feb. - Apr. of 2018. The Daddy of these cattle has all 6 stars of the tenderness gene, and 4 stars of the marbling gene, the Mommas are 5 to 6 stars Tenderness gene and 1 to 3 stars of the Marbling gene. FLASH: My 2014 harvest was spoken for in about 2 weeks as was my 2015 harvest and the 2016 harvest was sold out in less than 12 hours. So don't hesitate getting your contact information to me. A $100 deposit will hold your beef package for the harvest in 2018. Contact me now for 2018 harvest.